Jerusalem Day is an Israeli national holiday commemorating the reunification of Jerusalem in the 1967 Six-Day War. During the Jordanian occupation of Jerusalem, Jews were not allowed to access their holy sites, including the Western Wall. Jerusalem has been attacked 52 times, captured and recaptured 44 times, besieged 23 times and destroyed twice over the course of 3,000 years. Israel is the only country to enter the 21st century with a net gain in its number of trees, and you can enjoy them over a picnic or barbecue in the Jerusalem Forest. Jerusalem has more synagogues per capita than any city in the world. Jerusalem is the only city in which some 15 different Christian communities live alongside one another, according to the Jerusalem Institute for Israel Studies. Jerusalem is considered the eternal capital of the Jewish people. Jerusalem is the third-holiest city in Islam, outside of Mecca and Medina, both in Saudi Arabia. Jerusalem is mentioned more than 600 times in the Hebrew Bible, but not once in Islam’s Quran. In the Middle Ages, Jews were banned from Jerusalem by Christians, and Muslims later lifted the ban. There are more than 70 different Hebrew names for Jerusalem in Jewish scripture. Jerusalem is statistically safer than nearly most large U.S. cities and many major cities elsewhere in the world. Jerusalem hotels record more than 2.5 million overnight stays by foreign tourists each year. Thirty-thousand people ran in this year’s Jerusalem Marathon. Jerusalem’s Mount of Olives is home to 150,000 Jewish graves, dating back to the 1400s. Under Israeli rule, Jews are not allowed to pray on the Temple Mount, their religion’s holiest site. The Old City of Jerusalem is divided into the Muslim Quarter, Christian Quarter, Jewish Quarter and Armenian Quarter. The Dome of the Rock is not a mosque, but an Islamic shrine located on the Temple Mount. Although all branches of the Israeli government are headquartered in Jerusalem, the city is not home to any foreign embassies. President Donald Trump is considering moving the U.S. Embassy in Israel from Tel Aviv to Jerusalem. The 2.5-mile-long walls around Jerusalem’s Old City were built in 1536 by Suleiman the Magnificent. Jerusalem has more than 2,000 archaeological sites. Archaeology proves Jews have lived in Jerusalem since 3000 B.C. Archaeologists have found 3,800-year-old pottery in the City of David. Jerusalem has separate educational and religious systems for its Christian, Muslim and Jewish populations. Jerusalem has one of the highest-rated nightclubs in the world: Haoman 17. There are 26 wineries in Jerusalem, according to United with Israel. Bob Dylan held his eldest son Jesse’s bar mitzvah at the Western Wall. The actress Natalie Portman was born in Jerusalem. 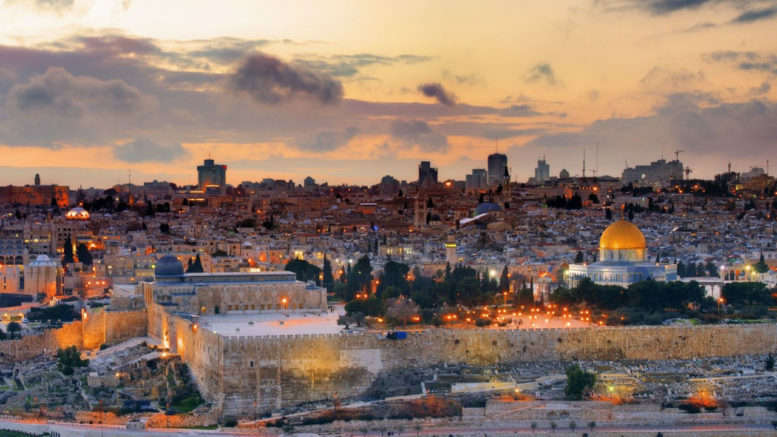 Jerusalem is Israel’s largest city in both landmass and population. Jerusalem’s population is comprised of 61 percent Jews, 36 percent Muslims, 1 percent Arab Christians and 1 percent non-Arab Christians. While the country’s self-identified “secular” Jewish population is 44 percent, Jerusalem’s secular Jewish population is just 19 percent. Of Jerusalem’s Muslim population, 62 percent identify as religious and just 1 percent identify as not observant. Jerusalem has had a Jewish demographic majority since 1864. Jerusalem represents about 0.001 percent of the landmass of the Middle East. Eighteen percent of Israel’s Arab population lives in Jerusalem, compared to 8 percent of Israel’s total Jewish population. Eleven percent of Jerusalem homeowners are foreign residents, compared to 3 percent in Israel at large. Thirty-four percent of Jerusalem’s Jews identify as haredi. Nearly 37 percent of all Jerusalem families live below the poverty line, which represents 61 percent of all Jerusalem’s children. Jerusalem is home to more than 400 high-tech companies. The number of high-tech start-ups in Jerusalem has grown from 200 to more than 600 since 2012. Fourteen percent of the Jerusalem workforce is self-employed. Arab families in Jerusalem are almost three times as likely to live below the poverty line compared to Jewish families in Jerusalem. This is attributed to a large difference in number of years in education. Seventy-nine percent of Jewish women in Jerusalem work, compared to 70 percent of Jewish men. Women in Jerusalem earn 25 percent less income than the average man, compared to 46 percent less in Tel Aviv. The Jerusalem-founded company Mobileye, bought by Intel this year, was part of the largest-ever acquisition of an Israeli technology company. This year, a noticeably high proportion (almost 50 percent) of newcomers to Jerusalem were 20-34 years old. Of those who move to Jerusalem, 38 percent come from Beit Shemesh and Tel Aviv. Brazilian immigration to Jerusalem tripled during the past year. The new immigrant population of Jerusalem—those arriving in the past 20 years—represents about 13 percent of the city’s Jewish population.